Uni-body Construction: Independently structurally sound components brought together to an Era Nouveau unibody frame. This same technology was used to engineer the Era Nouveau arm assembly. Interlocking arm assembly: Seat deck extends into and interlocking arm frame, creating a solid frame work joining the seat and arm. European hardwood: Entire structural frame is made of solid kiln dried European hardwood. “S” coil also known as “No Sag Springs” are used to create a durable and comfortable seat and back suspension system. Individual coil springs are placed and centered every 4 inches then permanently attached to the seat and back decks. The coils for seating area run from front to back and from top to bottom for all seat backs. Seat deck coils are interlocked with a braided cord to equalize the distribution of weight across the seating surface, creating a consistent and balanced seat. The key to Era Nouveau comfort is in our PREMIUM 2.2 High Density cushions. The Era Nouveau seat cushion is ingeniously designed to contour to all body types. We call this Plush Seating. Plush Seating is the balance of comfort from the Era Nouveau cushion and support from the “S” coil springs. 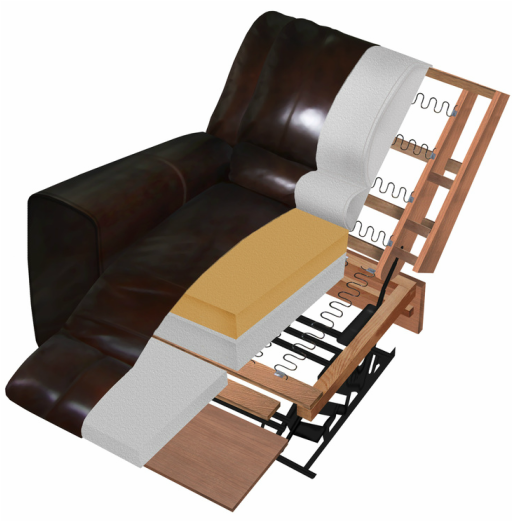 Back cushions and arm pillows are channeled or bellowed, two or three independent horizontal chambers. Each chamber has a specific amount (weight) of fill for proper support. This varies by model and desired comfort. Plush Polyester is an extremely soft and resilient material. We use Plush Polyester to provide extreme comfort at critical points, such as the arms and lumbar, areas that support the most sensitive parts of the body. Era Nouveau uses Leggett and Platt mechanisms exclusively for the US market. Leggett and Platt is globally recognized as the premier supplier of high quality and durable motion mechanisms. Largest US based residential mechanism manufacture and supplier.